First Person Shooter stories at Techdirt. stories filed under: "first person shooter"
I imagine it must be very, very annoying to be the creator of a video game and to feel as though some other company came along, cloned your work, and is now making money off of that clone. It's this annoyance factor that likely leads to so many legal proceedings over game "clones", even if so many of them fail because the it's the expression that matters in copyright suits, not a general or generic idea. Unique expressions are what matter. Even in totally misguided legal attempts, those involved usually have the good sense to go after games that directly copy graphics and such, not the general ideas behind the games. Which is simply not the case when it comes to Glu Mobile's lawsuit against Hothead Games over the latter's production of Kill Shot and its supposed straight cloning of Deer Hunter. 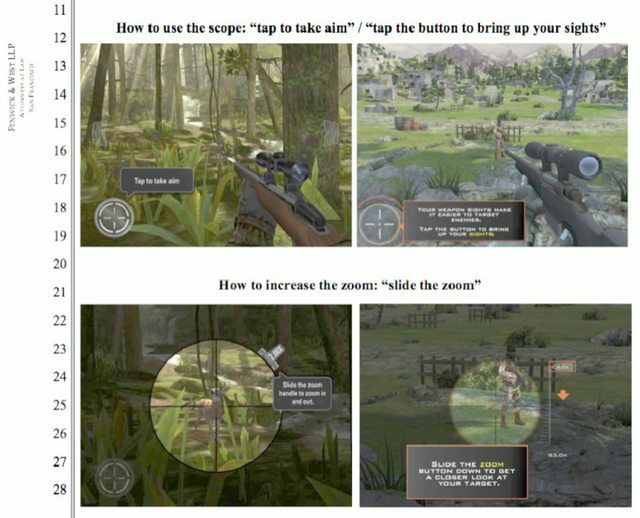 Glu Mobile is suing mobile game studio Hothead Games for copying it popular Deer Hunter 2014 mobile game. Hothead’s Kill Shot isn’t about hunting deer at all. Rather, you’re a sniper that hunts enemy soldiers. Nevertheless, Glu alleges in a federal lawsuit filed in San Francisco today that Hothead’s title violated copyright and trade infringement laws. It's not the only difference, though. Let's get this started by saying that the games do indeed have similarities. They are both shooters undertaken from the first person perspective with realistic guns and aiming sights that are used to shoot living things. But those living things are different, the settings are different, the concepts and themes are different, and even the models of the guns, while both realistic, are different. This is straight copying only insofar as the copying is of common and generic shooter-game concepts. Even the image Glu Mobile hand-picked to include in their filing demonstrates this. Yes, similar, but not the same, and even the similarities are of the basic shooter-game style variety. Yes, you can scope in on targets, but the scopes are different and scopes don't equal copyright. Yes, there's bullet time animations, but that doesn't equal copyright either, or else everyone owes the Max Payne franchise a pretty penny. While similar, these games aren't really any more similar than, say, Doom and Duke Nukem 3D. Or any other first person shooter from the 90's, for that matter. And this is from the image in their filing. Videos of the games in action show the differences more starkly. Again, similar, but they're both shooters, so what did you expect? Generic genre similarities don't rise to copyright or trademark claims. The trade dress claim in particular seems misguided, since the themes involved are quite different and none of the names of the games or companies even come close to being similar. This should end up as yet another lesson that similar generic concepts, such as sniping and zooming, don't translate to cloning as far as copyright is concerned. And, while the filing accuses a lot of copying, the reader is left with the feeling that there isn't a whole lot of weight there. Glu alleges that Hothead Games, based in Vancouver, Canada, copied things like Deer Hunter 2014’s marketing, tutorial, user interface, controls, virtual economy, pricing of items, and even some of its flaws. Akhavan noted, for instance, that a miscategorized assault rifle in Deer Hunter 2014 was also miscategorized in Kill Shot. Glu’s tutorial has 21 steps, of which Glu says Hothead copied 18. Many player reviewers mistake Glu Mobile as the publisher of Kill Shot because of the similarities, Akhavan said. Again, similar, but not the same. It seems clear that Kill Shot was inspired by the type of game genre of which Deer Hunter is a part, but basic interface and control schemes are not creative expression of a protected kind, and pointing to similar mistakes within the games when it comes to whether a weapon qualifies as an assault rifle is a stretch (trust me, it's an easy mistake to make and get yelled at by gun activists for). I can see why Glu Mobile might be annoyed, but I think their time would be better spent building on the massive success of their gaming franchise than in court suing a competitor.